These commonalities between Islam and Catholicism can serve as a tool to build bridges between Muslims and Catholics. This article on the commonalities between Muslims and Catholics is republished from the author’s website. Since he took his position as the Holy Father in 2013, Pope Francis has consistently encouraged Catholics to engage with Muslims as a means to build bridges of interfaith understanding. His call, however, appears to have fallen on deaf ears. According to a 2016 study by The Bridge Initiative at Georgetown University, only 14% of American Catholics have a favorable view of Islam. This troubling figure suggests that the gap between Muslims and Catholics is widening in the United States. While there are certainly theological differences between the two religions, there are also important areas of belief and practice that are shared by Muslims and Catholics. At a basic level, Muslims and Catholics are monotheists, or people who share belief in the notion of one God. Alongside Judaism, Islam and Catholicism have their theological and spiritual roots in Genesis, the first part of the Old Testament which shares the story of Abraham, the founder of monotheism. Pope Francis touched upon Abraham during a March 2013 interfaith event. In front of many world leaders, the Pope stated that Muslims “worship the one living and merciful God, and call upon him in prayer.” Indeed, every year, Muslims revere Abraham during Eid-ul-Adha, a commemoration of his supreme offering of his own son, Ismail, to God. Muslims and Catholics see Jesus as someone who performed miracles. Both groups consider him to be the Messiah. According to the Qur’an, Jesus was born miraculously through God’s spirit to the Virgin Mary, without having an earthly father. The Qur’an considers Jesus to be holy, sinless, perfect, and sanctified. Muslims are also told to believe that Jesus will return near the end of time to usher in a team of peace by defeating the anti-Christ. Reverence for Mary, Jesus’s mother, is another commonality between Islam and Catholicism. 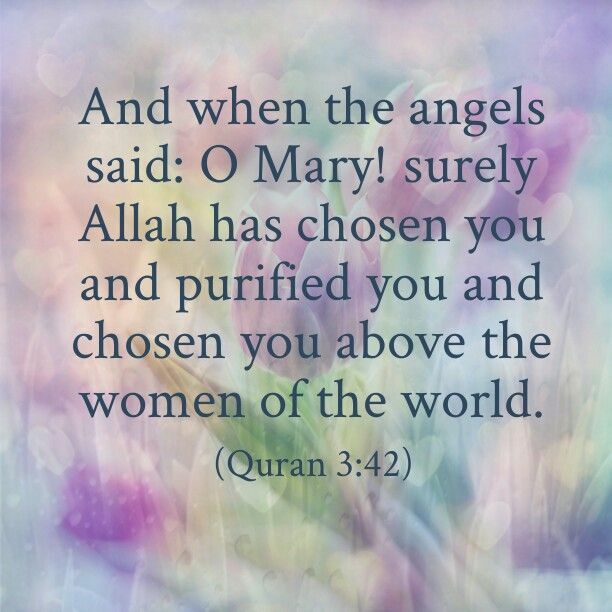 Catholics may be surprised to learn of the respect that the Qur’an gives to Mary, who has a chapter, “Surah Maryam,” named after her. She is mentioned in the Islamic holy book a total of thirty-four times, more than the number of her mentions in the Gospel. “How shall I have a son, seeing that no man has touched me, and I am not unchaste?” (Qur’an 19:16-21). Moreover, according to the Qur’an (21:91), God breathed into Mary His spirit, and made her and Jesus a blessing for all peoples. To obtain favor from God, Muslims and Catholics are also encouraged to participate in pilgrimages. The last of the Five Pillars of Islam asks Muslims to perform hajj, the spiritual journey to the city of Mecca, Saudi Arabia, at least once in a lifetime if they are physically and financially able. On the other hand, in Catholicism, there is no official “pillar” calling on Catholics to participate in pilgrimage. However, Catholics regularly visit several holy sites around the world including Fatima, Lourdes, and the Holy Land of modern-day Israel. Catholics also visit Vatican City and the Church of Saint Peter in Rome, the heart of global Catholicism. Anna Santo, the Holy Year which is celebrated every twenty-five years, is a popular pilgrimage time for Catholics. Muslims and Catholics use intercessors to connect with God. Although intercession is a contentious contemporary issue for Muslims, Sufis practice the seeking of intercession through saints. Muslims who participate in tawassul, the Islamic concept for intercession, believe that they are drawing closer to God. Tawassul also points to a hadith, or saying of Prophet Muhammad, in which a Muslim is told that he could seek intercession through Muhammad to cure him of his blindness. In contrast to Islam, intercession is an officially accepted religious practice by the Catholic Church. Catholics who use intercession pray to saints in the hope that they can obtain blessings from them on behalf of God. 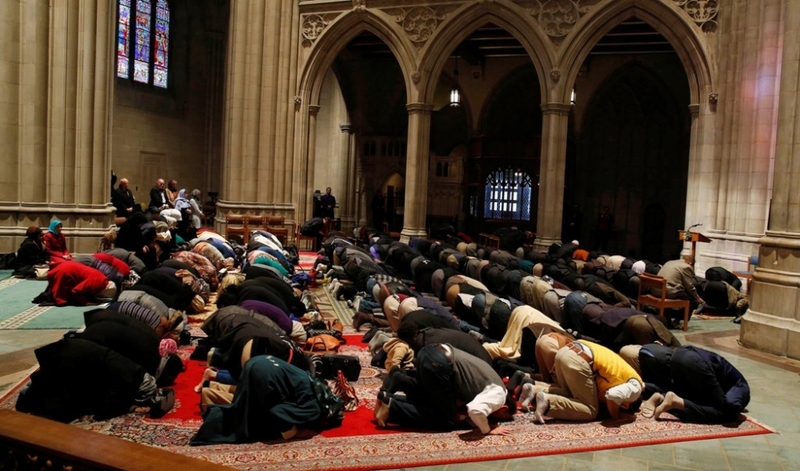 Muslims praying in Washington National Cathedral in D.C. Prayer is an important daily feature in the lives of practicing Muslims and Catholics. Both groups are called on to pray as an act of obedience to God. Salah, the Islamic prayer, is one of the Five Pillars of Islam which calls on Muslims to pray five times each day. Catholics, on the other hand, participate in the Eucharist, or the Holy Communion of the Lord’s Supper. This prayer is a remembrance to Jesus’s offering his body and blood for the sins of mankind. The Mass of the Eucharist mirrors the five daily prayers of Islam. During Mass, Catholics are asked to offer each other the sign of peace by extending their hand and warmly greeting their neighbor. This peaceful greeting is similar to the Muslim greeting of assalamalikum, or “peace be with you” in Arabic, which can also be offered with a handshake. Muslims and Catholics practice and preach the importance of charity and alms giving. One of the Five Pillars of Islam, zakat, is an obligation upon every Muslim to donate a portion of their wealth to the poor and needy. One of the purposes of zakat is for the wealthier members of society to give to those who truly need it, which in-turn redistributes wealth as a way to counteract social inequality. In Catholicism, charity is an important obligation. According to Saint Paul in Corinthians (13:13), “the greatest of these [faith, hope, and charity] is charity.” Catholics are encouraged to give a certain percentage of their income to the Church or other Catholic-run charitable causes. Indeed, in light of the teachings of Jesus, the goods of the Earth are meant to be shared by all human beings, not just for the more fortunate and wealthy members of society. Muslims and Catholics fast as a means to nourish the soul and give thanks to God’s bountiful offerings. Fasting is one of the Five Pillars of Islam. During Ramadan, the 9th month of the Islamic lunar calendar, Muslims fast from dawn until sundown and abstain from sexual activity, anger, fighting, and addiction to resist bodily pleasures and harmful thoughts. When the fast is broken at night, Muslims come together, generally at a mosque, for a feast. For Catholics, fasting is a form of penance to make amends for sins. Each year, Catholics are encouraged to fast and repent for forty days during Lent. On Ash Wednesday and all Fridays during Lent, Catholics are supposed to refrain from eating meat. These commonalities between Islam and Catholicism can serve as a tool to build bridges between Muslims and Catholics. 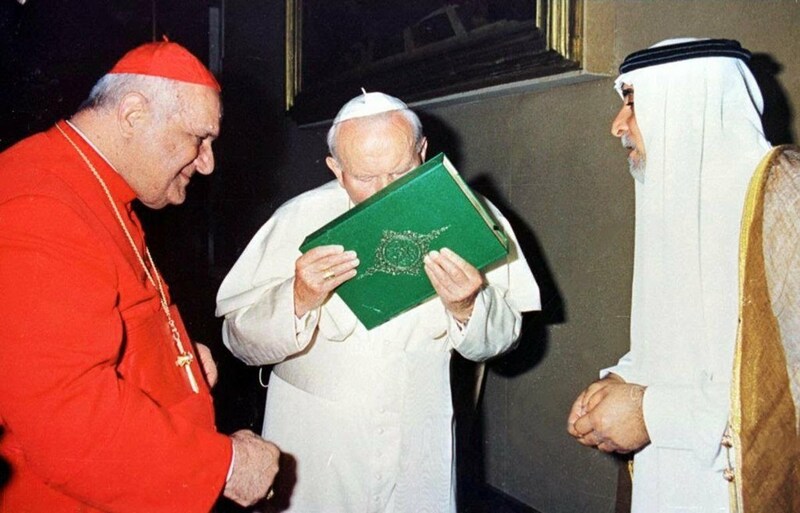 Peace between these groups is possible through dialogue and the investigation of the foundations of Islam and Catholicism, which have been outlined in this piece. Dr. Craig Considine (Irish: Carrig MacConsáidín) is a Catholic American and native of Massachusetts. As a sociologist, he focuses on religion, Islam, Christianity, interfaith, race and ethnicity, identity as well as comparative research and ethnography. How is Pilgrimage Performed in Different Religions?